The vertebral column is composed of the cervical, thoracic, lumbar and sacral bones that are aligned together in a manner that allows it to support the body and maintain an upright posture. With advancing age, the stress on the vertebrae can take its toll, resulting in changes in the bone structure and pain on movement. This change in the structure of the bone is called spondylosis. Spondylosis can be of three types depending on the bones affected. Lumbar spondylosis - here, the lumbar vertebrae are affected by the process of spondylosis. There are a variety of different reasons why spondylosis may occur. In addition to simple age-related changes, there may be a degree of osteoarthritis that can cause spondylosis. This can be either mild but can sometimes be rather severe. In addition, degenerative disc disease can result in spondylosis. Degenerative disc disease is a process where the intervertebral discs lose their water content and become hardened and calcified. 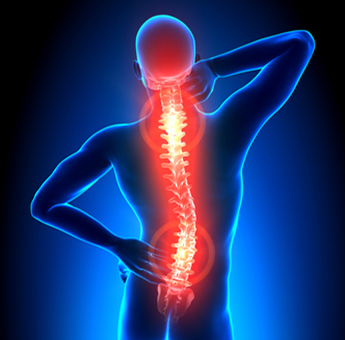 Other conditions that can cause spondylosis include narrowing of the spinal canal, also called spinal stenosis. This is often a congenital cause. Depending on which part of the vertebral column spondylosis affects, the symptoms and signs can be variable. For example, patients who have cervical spondylosis can develop tingling and numbness in their fingers along with a degree of pain and possibly even weakness in the muscles of the forearm and hand. Patients who have lumbar spondylosis may experience shooting pains down the leg that extend all the way up to the foot. There may be a degree of numbness in the foot along with altered sensation along the rest of the leg. In addition to these neurological symptoms, patients may also develop pain which can be rather distressing at times. Sleeping and performing day-to-day activities can be a problem. The diagnosis of spondylosis is made through specific scans such as an MRI scan or a CT scan of the spine. These scans will show narrowing of the joint spaces in between the vertebral bodies, thickening of the intervertebral discs along with evidence of degeneration of both the discs and the vertebrae. A simple x-ray will show small protrusions known as osteophytes from the edge of the vertebrae. The presence of osteophytes is indicative of underlying osteoarthritis. These findings are rather typical and when combined with a clinical history can make diagnosing spondylosis rather simple and straightforward. Depending on which part of the vertebral column is affected by spondylosis, treatments can be really above. For example, cervical spondylosis can be treated effectively with exercise and the application of a cervical collar. Patients with lumbar spondylosis may require transcutaneous electrical nerve stimulation, heat pad application, exercises and painkillers in order to get rid of the symptoms. In the rare cases, patients may have to undergo some form of surgery in order to get complete relief from the symptoms of spondylosis.